The 1-Tank Total Fuel and Combustion System Clean-Up! It's $10.50 and is only required every 4,000 miles! Improves gas mileage and performance by cleaning your entire fuel system to factory condition. 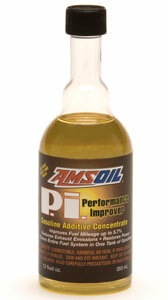 Smoother operation AMSOIL P.i. works as an “emissions passer.” It is ideal for use prior to emissions inspections.